You Are Beautiful! Style show and fundraiser in celebration and support of Hello Gorgeous! So maybe you have heard about Hello Gorgeous! of Hope Inc. and maybe you haven't. If you have, don't mind the revisit and stay tuned for information about our upcoming event. If you haven't, we are so excited to share with you and know you will be equally as excited as we are. Solutions Day Spa is a Salon Affiliate of Hello Gorgeous! 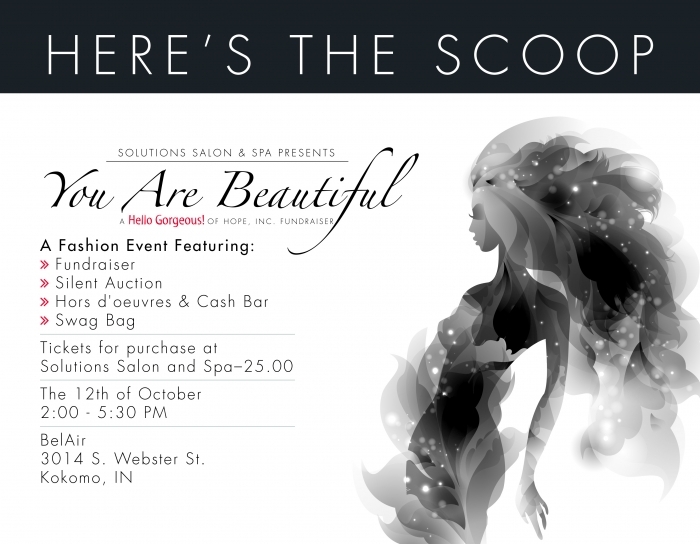 We have been so very blessed at Solutions to be a salon affiliate for Hello Gorgeous! As an affiliate, Solutions has committed to performing 12 Gorgeous Visits each year. Our staff gets so excited each time we have the pleasure of hosting and serving a woman from our own community. Let's face it--cancer touches us all at one point or another. We are grateful for the opportunity to give back to our community in this way. Our staff provides their time and education to these women and the salon and other local businesses provide many of the products and gifts that each Gorgeous Woman receives during her visit. As an affiliate, Solutions is also committed to supporting Hello Gorgeous! through fundraising. In past years we have raised funds through selling donated purses and handbags in our Purse Parade. This year, we are excited to host a style show and silent auction in support of Hello Gorgeous! and in honor of the women we have served over the last 3 years and those we will continue to serve going forward. So we invite you to join us in celebrating all of our Gorgeous Women and enjoy a night of fashion, fun, and fundraising. Tickets available for purchase at Solutions Salon and Spa for $25 each. Pastel hair: what you need to know before trying this trend. Crazy hair colors are nothing new. It seems like every year there is some celebrity defying the logic of hair color. This year the trend that has been seen round the world is pastel hair color. From beautiful lavender to cool blue, most anyone under the age of 30 has probably thought about jumping on the bandwagon. Previously we’ve seen these colors used as accents or in an ombre effect. This year celebs have gone full throttle, opting for a full head of these soft lovely colors. So what should you know before going pastel? Here is the scoop. Call ahead to check for availability of the color you want. These colors often require special pigment based hair color. While we carry many of these dyes, we recommend making sure we have what you want just in case we would need to order something prior to your appointment. It is rarely a one-step process. To achieve these soft colors, your hair needs to be very light. Unless you are naturally super blonde, you will likely need to have your hair lightened before your pastel hue can be applied. This can sometimes be done in one visit but not always. You should consult with your stylist to see what the process will be for your desired result. The color will often fade within a few short weeks. This means there is a lot of maintenance involved with pastel hues. In order to maintain the color you want you will have to make regular visits to the salon for color touch ups. You will need to be cautious of the products you use as well as how often you wash your hair. There may also be special products your stylist will recommend to maintain and prolong the color. When they make these recommendations it really is to keep your color beautiful—not to make you spend money. Your stylist will likely also recommend you spread out washing your hair in order to help your pastel hue last longer. Again here, products may be necessary such as a dry shampoo. A consultation with your stylist is really necessary prior to your appointment. During a pre-appointment consultation, you stylist can check the condition of your hair and determine if it is in good health to work with a dramatic color choice. They can also check the color on a few strands of your hair during a consultation. There is a fair amount of necessary maintenance required. Since your hair has to be lightened before the pastel color is applied, you will need to be lightened each time you come in for a touch up. This will just be on your new growth, so if you keep regular appointments there won’t be as much time involved in follow up visits. You should also keep in mind that lightening the hair can be damaging so regular trims and conditioning treatments will help keep your hair looking healthy and your color looking vibrant. We hope this helps when you are considering going pastel…or bold! Special thanks to Christina Bainbridge for helping with this post! 250 years of weekly visits of what is equal to ONE tanning bed session? So recently, our nail technicians have been getting a lot of questions about the safety of our shellac manicure. At the end of this post we have linked a video from an industry professional which answers many of the questions you might have. But to start, lets talk about what a shellac manicure is and it's benefits. Why do we love shellac so much? It REALLY lasts up to 2 weeks. Around the salon the hair stylists are in and out of water and hair color and products all day. They all rave about shellac manicures and their longevity. Zero dry time. As soon as your manicure is finished you can do anything with your hands without fear of messing up your polish. It is shiny and maintains a beautiful finish throughout the wear time. It stays hard which helps a lot of us keep our nails a little longer than without polish. There are tons of great colors to choose from. What is the concern about? 250 Years of weekly shellac manicures to equal the UV exposure of ONE tanning bed session!!! There are also concerns about the health of the nails. Most of us know that artificial nails can be very damaging to the nails. Shellac manicures are great because you remove the polish each time. Also, when you apply cuticle oil to your nails regularly while wearing shellac polish, your nails receive the nourishment the oil provides and remain healthy and strong. Bottom line: enjoy the beautiful shiny nails you get with a shellac manicure without fear of UV exposure!